Elaborate hats and fascinators were the essential accessory at today's Royal Wedding. VIP guests wore many versions of the headpiece, from the stylish to the outright insane. Princess Eugenie wears a bold blue headpiece with purple flowers and a spray of white feathers. Princess Beatrice wears an outrageous structural hat in beige. Did she borrow it from Lady Gaga? 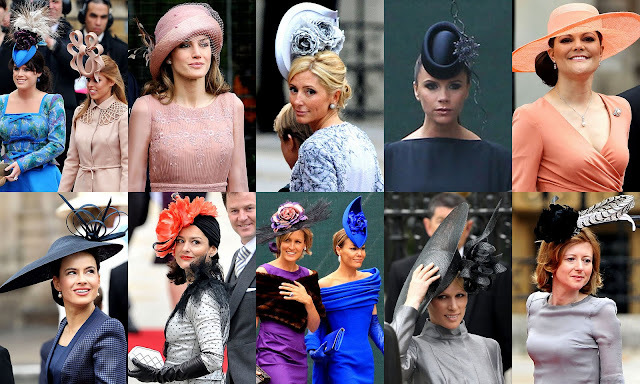 Both royal disasters are by milliner Philip Treacy. Spain's Princess Letizia matches her dress to her sweet pink tulle-topped hat. Princess Marie-Chantal of Greece wore a light blue Marie-Antoinette inspired headpiece, decorated with rosettes. Victoria Beckham opted for an oval pillbox hat with twisted accents in navy blue. Princess Victoria of Sweden looks classy in a simple coral wide-brimmed straw hat. Lady Frederick Windsor dons a sculpted navy blue hat with loops and twirls. Spanish beauty Miriam Gonzalez Durantez wore an exotic floral creation in orange. She is the wife of Deputy Prime Minister Nick Clegg. British socialite Tara Palmer-Tomkinson looks ridiculous in this bright blue tear-shaped hat. Can she even see properly? She is accompanied by her sister Santa, who wore a flamboyant floral nest. Royal bride-to-be Zara Phillips holds on to her larger-than-life black hat with large flower attached to one side. Chancellor George Osbourne's wife, Frances wore an elaborate black and white feathered fascinator.